^You make it sound so nice. And yet I don't care for bacon. I find it objectionable. Its fattiness, its greasiness. The flavour doesn't appeal. I even dislike the word (bacon? Get the hell out of my language, you disgusting French loan-word, you. Ick). ...maybe my taste-buds are simply misprogrammed. Like, I don't like the things real humans like. Pepperoni, avocado, 7-Up. Dairy products in general. Mayonnaise. Kraft dinner, and potatoes au gratin. Frozen waffles and french toast. Ranch dressing. Turns my stomach. Rather have some nice sauerkraut or black licorice. Can of sardines (in mustard sauce, obviously-----------what am I, a savage?) Pickled herring, pickled eggs. Anchovies. Red onions. Beer. Black pudding, and beef liver. Corned beef hash, browned in a skillet with a sunny up-top. Prepackaged ramen and yakisoba---------that's my lifeblood, man. Mmmm. There's a frozen section in my store, a whole freezer devoted mainly to pierogies. I feel a sincere need to check them out. I'm not Polish, or Jewish, and so I've never had a pierogie before. I presume they're pretty rad. The recipe is also good with prosciutto. Same meat cured differently and way less greasy. I've also done it with no meat and a bunch of veggies. I like versatile recipes. Early this decade I experimented with no-cheese pizza, to satisfy my lactose-light biz. Like, one can do it just normal, only without the cheese; or one can thicken the sauce to a paste so as to hold the toppings better. The results of the latter were unusual-----------like, imagine a shepard's pie, consisting of all pizza ingredients. To be honest, it wasn't very good. Still, the cause of food mad science isn't advanced solely by victory-------even the missteps can be a rung on the ladder, as long as you insist on learning from them. Made Peanut Chicken per this. The peanut mixture tasted really good in the bowl, but wasn't as strong as I was expecting in the chicken, so I probably need more than that next time. Which is a little surprising since I'd already deliberately used more than the recipe called for - quite a few of the measurements it called for seemed tiny relative to the amount of chicken. Maybe they have tiny chickens wherever that person is from. Still really good, at any rate. In a small bowl, mix the maple syrup, soy sauce, garlic, garlic salt, and black pepper. 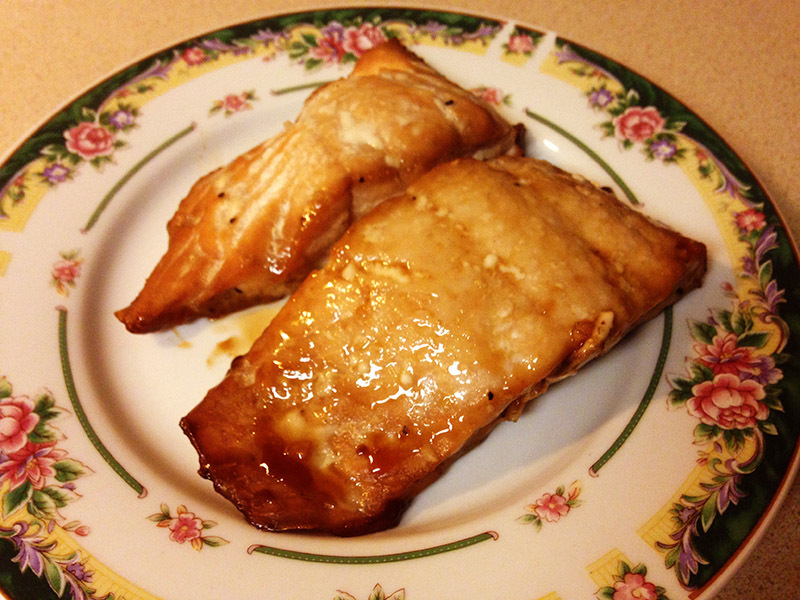 Place the salmon in a shallow baking dish, and coat with the maple syrup mixture. Cover the dish and marinate the salmon in the refrigerator for 30 minutes, flipping the salmon once. Place the baking dish in the oven and bake uncovered for 20 minutes, or until the salmon is easily flaked with a fork. If you're like me, you've never once thought to yourself, "You know what would go really good with fish? Maple syrup." But dang, does it taste good. I was afraid the maple flavor might be too clashing or overpowering, but that wasn't the case at all. I could see it, I've done something similar with chicken and pork. I made the peanut chicken again a few days ago and mostly improved on it, but I forgot to lower the heat for the third step and ended up somewhat burning quite a lot of it. Made my third try today with pork instead of chicken and I think I finally got it right. Thanks, they're family heirlooms. I take them for special occasions, like microwaveable pot pies. Accordion-cut each potato, making sure not to cut all the way through. Place the potatoes onto the baking sheet. Whisk together the melted butter, olive oil and garlic in a small bowl. Brush the mixture over the potatoes, then add salt and pepper to taste. Bake for 20 minutes, until the slits are starting to separate and the potatoes are beginning to turn golden. Brush the potatoes with the remainder of the butter mixture, then sprinkle the cheeses on top. Bake for another 23-25 minutes, or until the potatoes are crispy on the outside and tender on the inside. I goofed this one up a little. When baking you want the butter and cheese to get inside the slits you've cut into the potatoes, so they can melt in there. 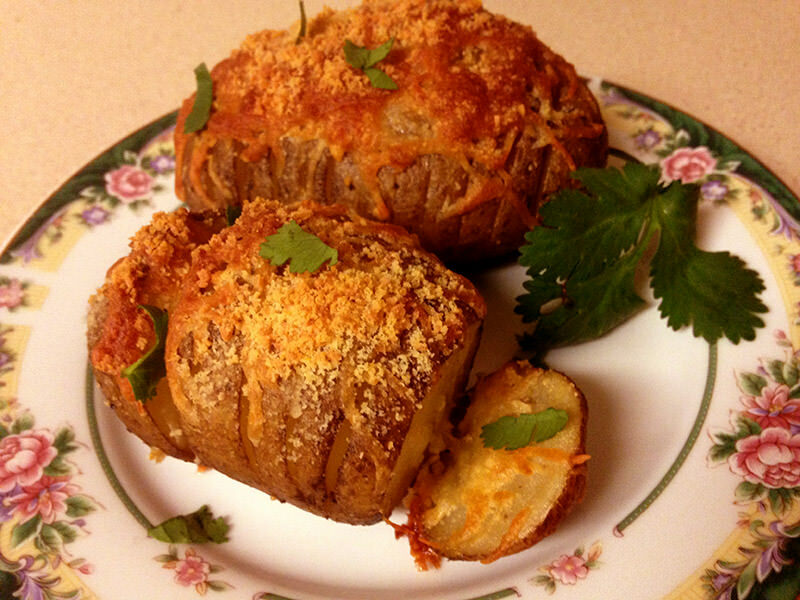 I failed to do that, so while the outside of the potatoes were nice and cheesy, the insides were pretty bland. Whoops. Also, the recipe called for parsley, but I used cilantro because I like it better. Last night I made a quinoa salad-type thing and it was SO GOOD FAM. I sauteed some Anaheim peppers (if you're not familiar with those, they have a flavor unlike those dreadful bell peppers but they won't scorch the tongue) until they blistered and also prepared a vinaigrette made from orange juice (I used an actual orange because in my case, it was just easier to do it that way), dried dates, scallions, pecans, and a sploosh each of olive oil and red wine vinegar. Once the quinoa was done cooking I just combined everything together, added in some goat cheese, topped it with a soft-boiled egg, and kaboom. Mix pudding, whipped cream, & smashed Oreos. 1) Whisk together 1 package of instant vanilla pudding mix, 2 tbsp instant chocolate pudding mix, & 1.5 cups milk. 2) Stick that bowl in the fridge for 10 minutes. 3) Disintegrate 15 Oreos (cream included) by any means necessary. 4) Mix Oreo dust into the pudding. Serve by itself, or with sprinkles, or with cookies as a dip, or whatever you want. I'm so hungry for that right now. I've done, well, sort of that, but it was a death-by-chocolate trifle. Yum! Well, I've already fallen off the wagon on this. I did make pancakes today, although that was using a premade mix, so it doesn't really count. I haven't made pancakes from scratch since I was a kid. tbh I like the mix better. I fried chicken schnitzel and ate it with roast vegetables tonight. ^Hmmmm. Wish I had your ambition, dovey. Most nights it's all I can do to put the kettle on, cook myself up a cup of coffee and some udon.